Click above for complete view. Engineering research expenditures over the decade 2007-2017 showed strong overall growth in the early years, powered by federal spending. Although university researchers survived the Great Recession of the late 2000s without a serious drop, the rate of increase slowed, with federal funding staying basically flat through 2016 and state expenditures slipping until 2017. During a down period in government support from 2014 to 2016, industry helped fill the gap. The year 2017 saw an increase of 2.8 percent over the previous year, with federal money accounting for 66 percent of all research expenditures. 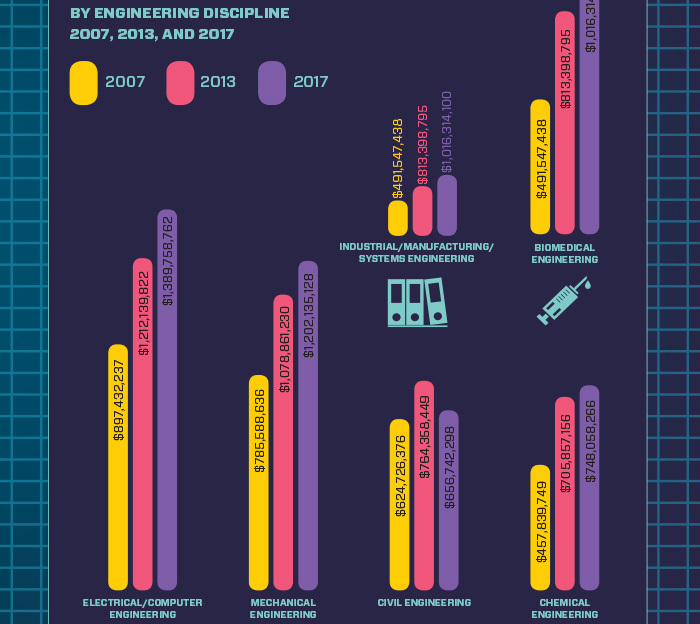 Among all disciplines, electrical and computer engineering attracted the most research money throughout this period. Other major disciplines all saw increases, with the exception of civil engineering, which experienced decreases two years in a row. “Other engineering” dropped significantly in 2017.